News Anchor: From a secret island in the South Pacific, the courageous Tracy family run an organization called International Rescue. When disaster strikes anywhere in the world, they are always first on the scene. They go by the name they gave they're incredible machines. The Thunderbirds. 5 - 4 - 3 - 2 - 1 - Thunderbirds are GO! Q: Are there any basic differences between this movie and the TV series? Warning: contains spoilers! Q: Why are there so many vehicles made by the Ford Motor Company in the film? Q: In what year is the movie set? If you don't know it, don't make it! Once upon a time young children sat down with their Fathers or maybe their bigger siblings and they watched a show. It was a television program that held them transfixed with tales of bravura and technological wonders. Lots of young children dreamed beautiful creative dreams because of this show. Fast forward to Christmas 2004. 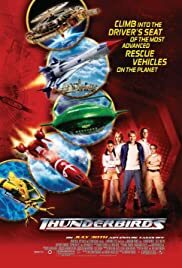 Lots of kids are gonna get a DVD called "Thunderbirds". The producers of this movie should get used to the singular "clang" sound because I can imagine lots of kids are going to toss this into wastebaskets the day after (or maybe the same day). They are throwing away the most thickheaded attempt at re-creating television greatness that this reviewer has ever seen. I am not saying that the original "The Thunderbirds" was the best of shows. It was a puppet show for chrissake! It had huge limitations based on what we know today. .all heroes. And then there was Brains. An unparalleled engineering genius and our little secret. As much a part of the team as any other single member. As much flawed and quirky as he was amazing and lovable. Brains was not perfect, but he was the best Mother Earth had to offer. But the true beauty of this old show, the reason all of us got up at 6.00am to watch, was those wonderful beasts, the Thunderbirds themselves. Gerry Anderson knew that his creations were the star of the show and he made sure they were kept front and center. So, with this movie, what the hell where the producers thinking? Whoever was in charge, and I am not saying it was the Jonathan Frakes, had simply no idea. Obviously they had no idea that they were playing with an institution as opposed to a "cool plot idea". OK, the technical stuff was there. I thought the updating of our beloved Thunderbirds was quite good to a point. And Tracey Island seemed up to it. Had all the right stuff, except we never saw it work right. After that? It was all downhill into the pits. And it went pretty low. The script wasn't written, it was excreted. The casting was abysmal. The costuming was third rate. As a Father, I would be embarrassed if my son said this was a cool film. It would mean I would have to explain to him why it isn't. He is gonna see the original series one day so I have to. Whoever the mastermind is that concocted this mess should go away. To the producers that still own the rights? Give it another shot. People want to see the Tracey's solving problems as they do. Make my kids proud. Make me proud. 78 of 109 people found this review helpful. Was this review helpful to you?